Confucius says a mountain cannot contain two tigers. 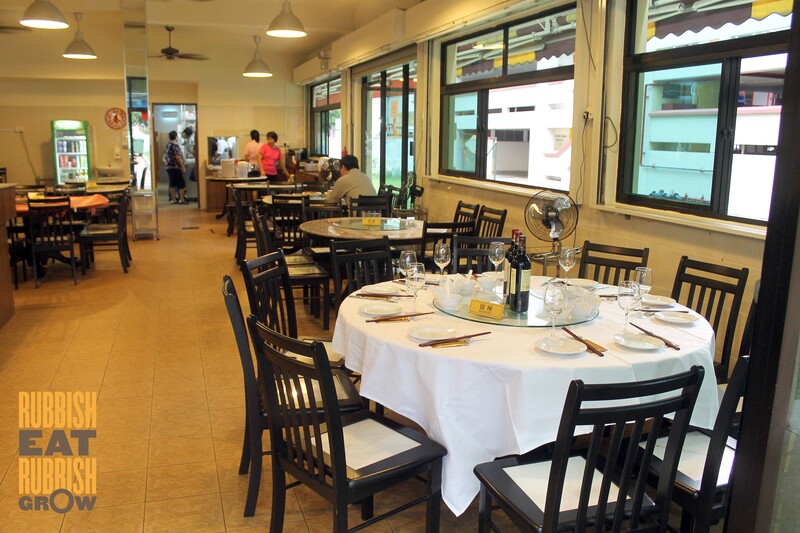 Side by side at a prime location, at the intersection of PIE/KPE and Geylang, just 10 minutes’ walk from Kallang MRT–Which cze char restaurant is the winner? Chef Award-winning Frankie Lim, with more than 20 years of experience. He oversees the cooking. I replied, “Don’t anyhow say! Wait he chop us and make char siew bao.” Celebrity chef Eric Teo is just a partner. Young chefs from Johor Bahru helm the kitchen. Old-skool. Got table cloth. With air con! 几 hot 一下 wor! No air con. 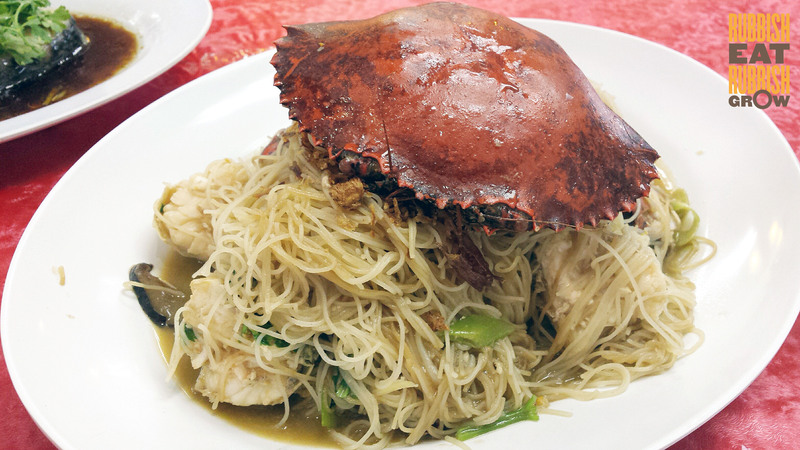 Wet crab beehoon ($55). SUPER SHIOK! 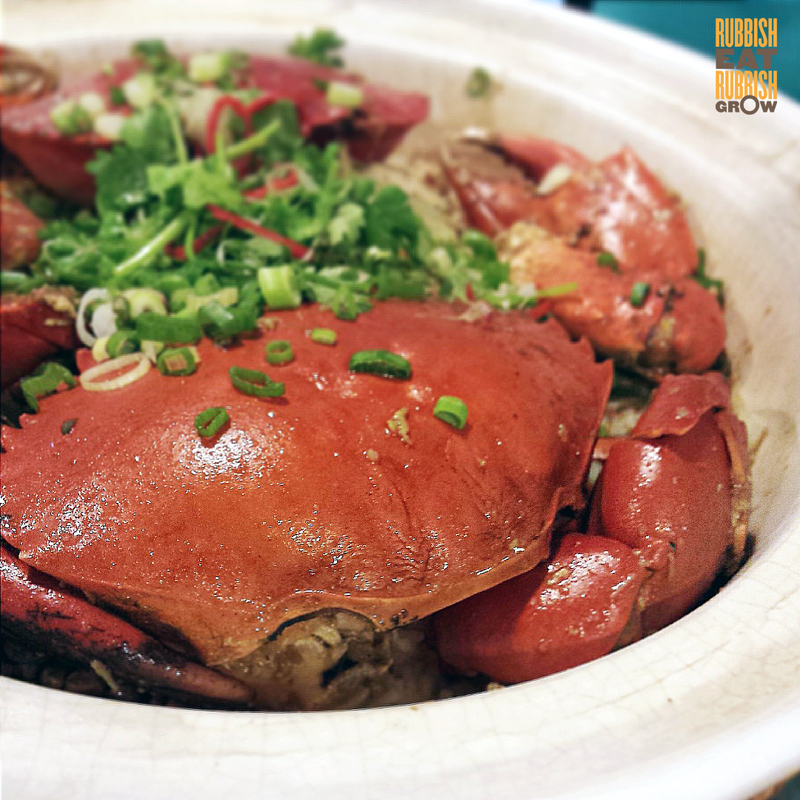 Got wok hei, noodles absorbed crab’s sweet essence. 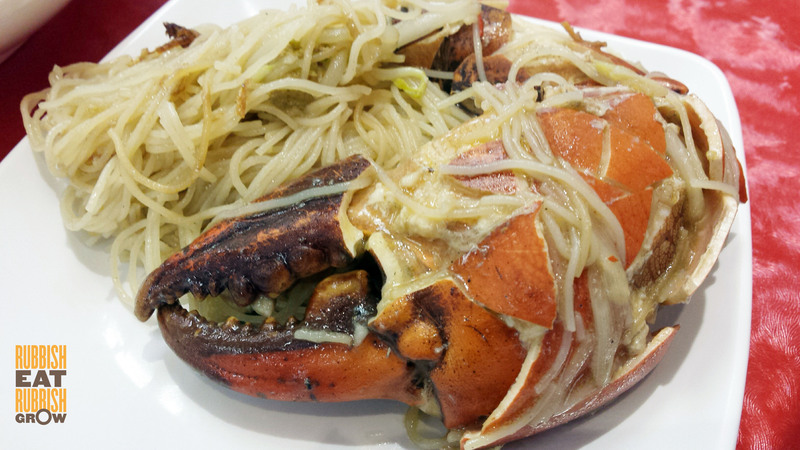 Huge crab, suitable for 4 persons. Addictive till the last bite. Bonus: Awesome sambal chilli by the side. MUST ORDER. Crab rice ($45 for 1 crab, $80 for 2). Rice fried with bacon before boiling in stock. When stock was almost absorbed, crabs and fried dried sole were added, so the juices from crab dripped into the rice.After hearing so much raves about this dish, it was disappointing. It tasted like fried rice, nothing spectacular. Even SgFoodonFoot, who was eating with us, said that it wasn’t as nice as the first time he had it. 怎么酱的wor? House of Steamed Fish, must eat fish right? Many different types to choose, a little confusing. 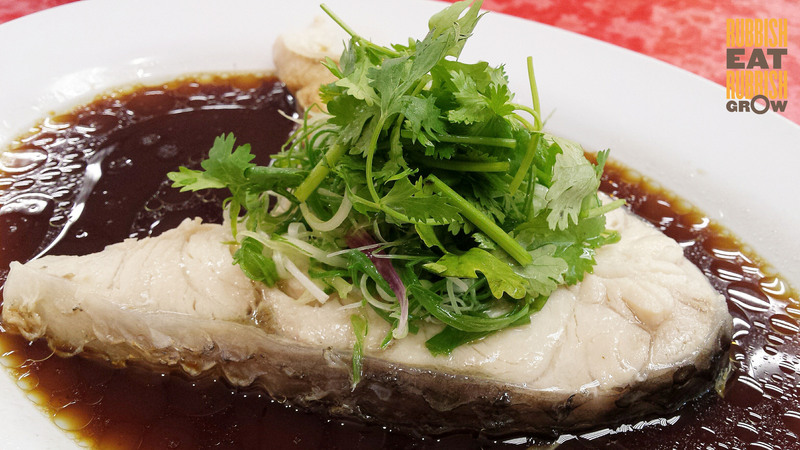 In the end, we got a cod (no bones, easier to eat) in Hong Kong style ($24), steamed in soya sauce. The fish had a fishy stench 腥味 but when eaten with pungent spring onions, it was fine. Disappointing, considering the name of the restaurant. 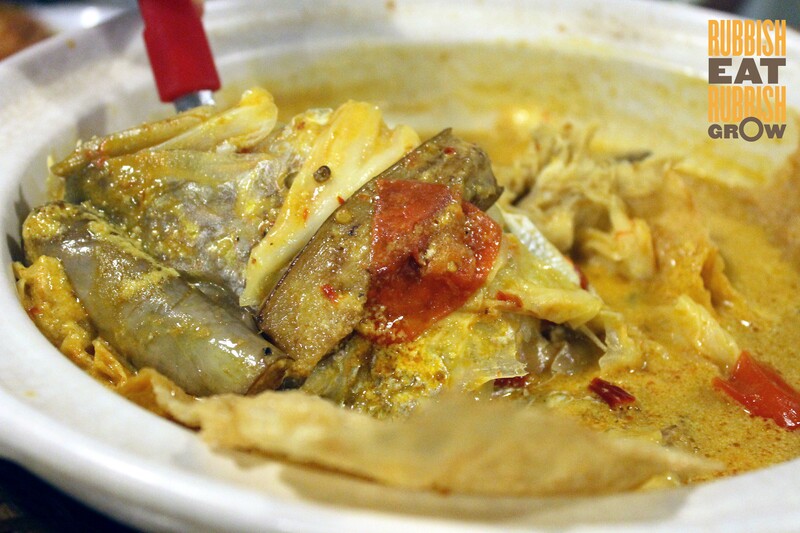 Fishhead curry ($28) JB style. A little too light for me, no spice, no love, man. And it was only half a fishhead, we all lamented there was not much flesh. My friend’s favorite dish of the night, spinach in stock ($10). 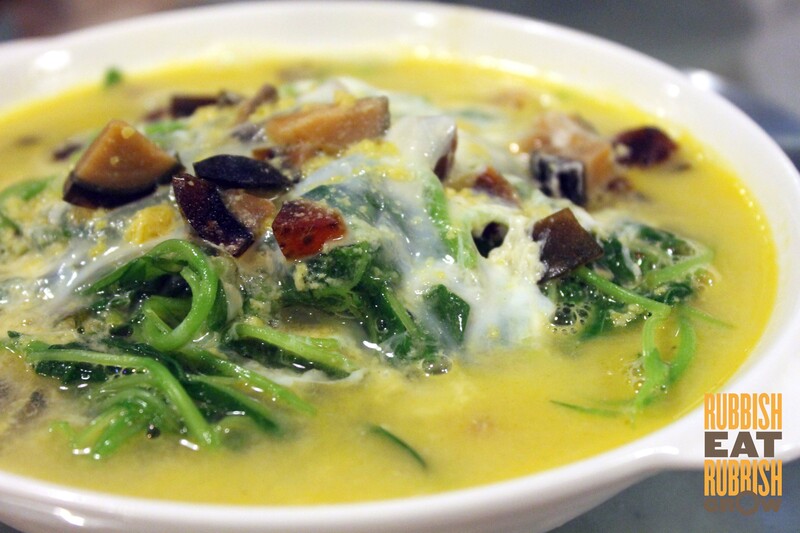 Topped with garlic, and wolfberries, the stock was light and refreshing, with a hint of ikan bilis. Can drink as soup. A rather weak tri-egg spinach ($12). 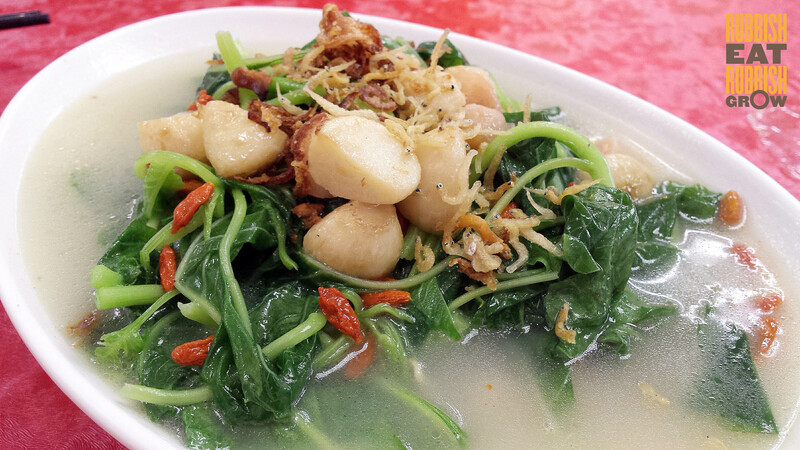 Bland stock, and limp spinach with few strands. 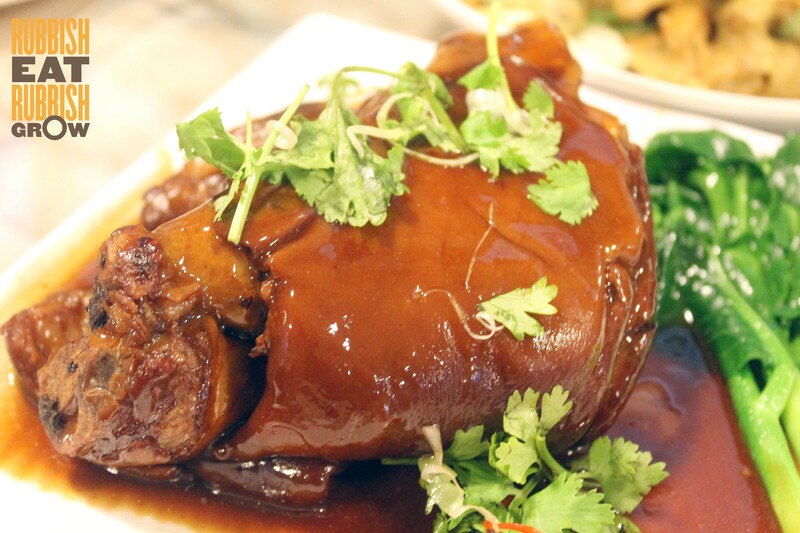 Luckily they ran out of pumpkin for the pumpkin trotter ($28), so they offered an off-menu dish, honey trotter ($28), which, according to Sg Food on Foot who tried the pumpkin, was better. We all agreed it was the best dish that night. Skin was gelatinous but not slimy, meat was soft and flavorful.Muar otah ($10), shrimp paste chicken ($12), and salted egg yolk prawns ($18) were admirable, but not out-of-the-world. – Ingredients, such as the crabs and prawns, were not good quality. Service Pretty good, and attentive. But lady boss must have mistaken my friend and I for pigs for she recommended one dish too many. She ought to have warned us. Really sweet on the phone when I was making reservations. But they weren’t paying attention at most times, even in an empty restaurant. Still, when you can get their attention, they are swift, and polite. Price We paid $92 for two persons, or $46 for one. There was enough food for 3 persons, but we didn’t know and the lady boss didn’t say anything. If 3 were eating, then $30 for one person would have been justifiable. Paid $208 for 7 persons, or about $30 for one. 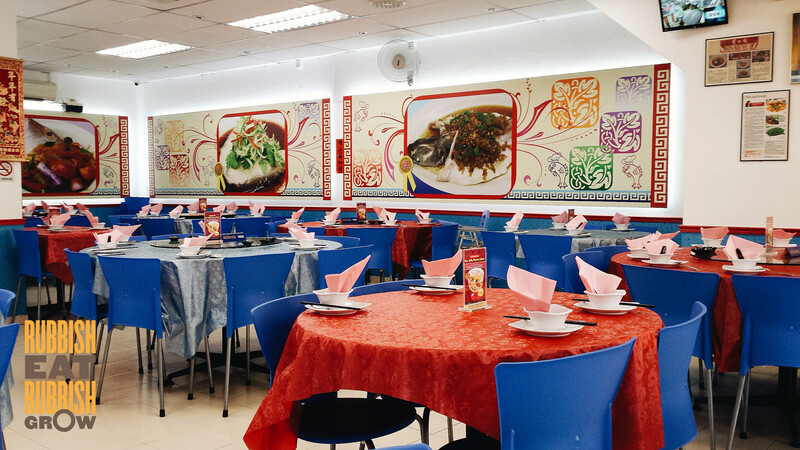 There are different varieties of cod fish leh. If you’re thinking about the premium kind that is $20 a thin slice sold at supermarkets, then you’re right, this isn’t that. Thanks for the info. I still have lots to learn! How do you tell the difference by the way? I cook at home but supermarket fish isn’t a good indicator of fish. The fish I ate had fatty parts and chunky texture. Usually cods have fatty parts and chunky texture, no? And threadin is darker and flakey. My fish was fatty. That’s why I mistook it for cod. Thanks!